Immerse yourself in the splendid isolation of Tasmania on the Bay of Fires walk, famous for crystal-clear waters, pristine white beaches and orange lichen-covered granite boulders. Explore the 38-km long Freycinet Promontory, a wild pristine coastline with beautiful beaches, clear blue seas and ancient forests scattered with rare wildflowers. Take a boat trip to a secluded beach away from the crowds to climb Mount Freycinet where you’ll witness unobscured, unprecedented views back across the Freycinet Peninsula and over Wineglass Bay. Overlook Wineglass Bay and its perfect arc of blond sand and ice-blue water. Start in Launceston at 7:30 am then drive towards Musselroe Bay. Our first Bay of Fires walk of about 15 km embarks from Stumpys Bay via Boulder Point to Deep Creek in Mt William National Park. For guests who want to shorten the walking, an alternative is available. Time permitting, we may visit the lighthouse on the way back to your accommodation. After a hearty cooked breakfast, collect your walkers lunch and travel a short distance to Deep Creek. Our second Bay of Fires walk takes us to beautiful Ansons Bay via extraordinary lichen covered rock outcrops all the while bordered by pristine beaches and the crystal-clear sea. After this, we head to Freycinet Lodge for a well-earned hot shower a pre-dinner drink if you choose followed by a chef-prepared two-course meal. It’s breakfast, then onto the boat for a cruise past the Hazards to Cooks Beach. Seeing the landscape from the sea gives an entirely different perspective of the peninsula. Walk to the top of Mount Freycinet, a moderate distance, but it does include a short challenging climb. Another shorter walk is available, but this shouldn’t be missed as the rewards are well worth it. 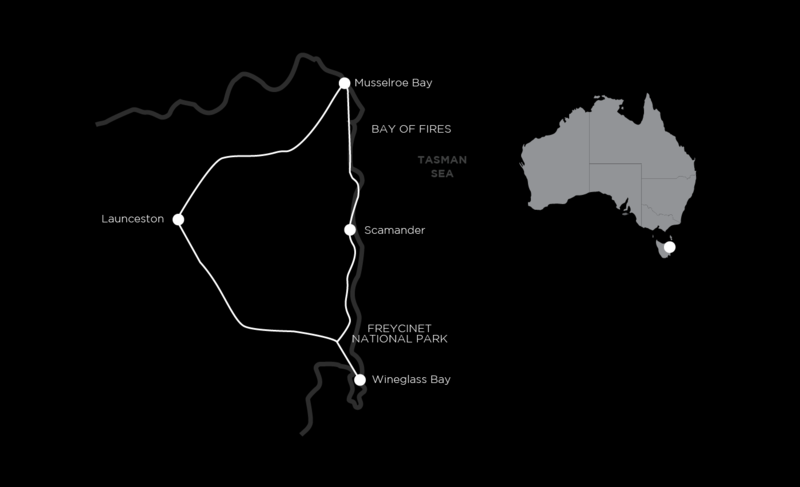 After breakfast, trek to the famous Freycinet Wineglass Bay and Hazards Beach Loop. From the lookout, admire Wineglass Bay, eventually experiencing it up close up on the beach – sand between your toes and going for a dip if you choose. The stunning views over the peninsula including Wineglass Bay makes a perfect bookend to a 4-day walk that begins with stunning remote beaches and ends with epic views. The tracks are well graded and mostly easy to negotiate. Full day walks average about 14km on mostly flat surfaces other than at Mt Graham. There is an opportunity for fit walkers to challenge themselves on some of the days by adding more walking. The last two nights are at the fabulous Freycinet Lodge in rooms with ensuite bathrooms. Some have the added bonus of shared lounge rooms. We also stay one night at the remote working farm, Icena (or Tidal Waters on the first night). On the Bay of Fires walk section the accommodation at Icena is in a picturesque rural location and is spacious, but has shared bathrooms. Please note at Icena, the rooms vary with a few rooms having ensuites; these will be shared out on the basis that the first double bookings will receive the ensuite rooms. Each day you’ll be provided with a substantial walkers lunch. This may include a high protein type salad, a roll or a wrap, a muesli bar, cake or muffin and a piece of fruit. Lunch is always augmented by Auswalk’s famous trail mix so you’ll never go hungry. In addition to that, you’ll get to eat it at a fabulous location on the track. Dinner at Icena is an elaborate three course affair and includes drinks. At Tidal Waters it is a 2 course a la carte meal (no alcohol provided, but ensuites are available) and breakfast is always cooked and at Freycinet is prepared by their fabulous chefs. The fabulous two course dinners at Freycinet Lodge are again prepared by their in-house chefs. Alcohol and drinks are not included with meals (except tea/coffee and juice with breakfast). The walk starts in Launceston 7:30am and finishes in Launceston late afternoon around 4:30pm. We have graded the walking on this trip as easy. The walking on the first two days on the Bay of Fires walk is easy to moderate, with some beach walking. At Freycinet there is some steep sections but overall the walking is easy to moderate. This trip operates with two professional guides ensuring that you have both a safe and enjoyable walking holiday. Guides are knowledgeable of the area, including flora and fauna and they can offer easier and harder walk options along the way. Pre and post tour accommodation: There are many good hotels in Launceston, however we pick up and drop off from two central hotels. The tour starts at 7.30am at the St Ives Apartments, 67 St. Georges Terrace, Battery Point, Hobart. The trip ends at approximately 4:30pm on the last day in Launceston. Summer is our preferred time of year for hiking in Tasmania. The east coast is suitable from November to April.